Monaco striker Radamel Falcao could be fit to play for Colombia at the World Cup after having knee surgery. 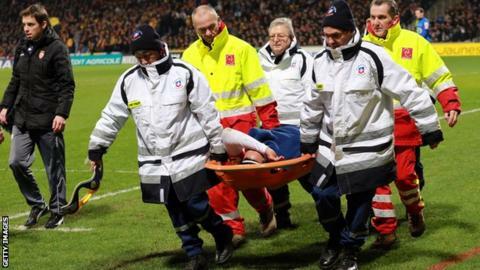 The 27-year-old suffered anterior cruciate ligament damage in a heavy tackle in Wednesday's 3-0 French Cup win at Chasselay Monts d'or Azergues. Recovery time for such an injury is usually between six and nine months but the doctor who operated on Falcao is optimistic he will be back sooner. "It went well," Jose Carlos Noronha said. "The light at the end of the tunnel isn't small." He also managed nine goals for Colombia in their World Cup qualifying campaign to help the South American side book their place at Brazil 2014.